Click the link below to download a copy of the Loyola ▪ Notre Dame Library's Information Literacy Program Plan. 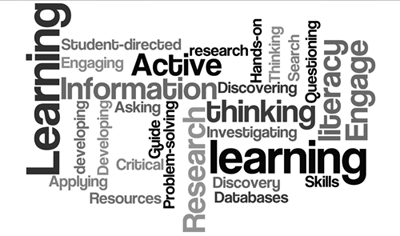 The Research & Instruction Department is available to teach your students how to use the library research resources. Sessions last 50-90 minutes and can cover such topics as how to effectively search library databases, the library catalog, and other key resources for conducting research; how to access the full text of articles; and how to evaluate information found in databases or on the web. If you would like to schedule a library information literacy session or talk to librarian about developing a session for your students, please use this form. The mission of the Loyola ▪ Notre Dame Library’s Information Literacy Program is to advance the information literacy skills of the students of Loyola University Maryland and Notre Dame of Maryland University in support of the missions of both schools to promote intellectual excellence, personal development, and strong leadership. Information literacy is the ability to access, evaluate, organize, and use information effectively and ethically to meet a need. It forms the basis for lifelong learning, and is common to all disciplines, learning environments, and levels of education. The development of information literate students is the shared responsibility of the faculty and the library and requires a cohesive integration across the curriculum. Loyola ▪ Notre Dame Library’s Research & Instruction Department is committed to collaborating with faculty to develop and coordinate an effective, cross-curricular Information Literacy Program. This approach will foster critical thinking skills and competent retrieval and use of information in order to prepare students for the challenges of academia and for their personal and professional lives. The Loyola ▪ Notre Dame Library (LNDL) Research & Instruction Department believes that incorporating active learning techniques, tailored to and integrated with class assignments, is the most effective approach for delivering library instruction. LNDL’s Information Literacy Program is guided by the philosophy that students learn best by doing rather than listening. For this reason, all library sessions incorporate active learning techniques that engage students and promote problem solving and critical thinking. During these sessions, students search specific library databases and resources as a group, working with the librarian as a guide. Students are asked to take the lead in the search process and provide answers to questions and problems that arise along the way. This allows students the opportunity to apply new skills in a supportive learning environment and build on previous knowledge as they discover how to effectively search for and evaluate resources. The goal of each library session is to prepare students to be successful in their current research assignments, and to strengthen skills that will allow for continued research throughout their educational and professional careers. As educational technologies continue to develop and grow, so does their ability to provide quality learning opportunities to students at any time and from any place. For this reason, in addition to in-class instruction, the Research & Instruction Department offers online video tutorials and research guides that students can access from their computers or mobile devices. The department also offers one-on-one in-person and online consultations for students, faculty, and staff in order to provide additional personalized instruction at the point of need.